The drama that is deflategate may soon be shifting from the New England Patriots, and specifically Bill Belichick and Tom Brady, to the referees themselves. According to sources of 98.5 The Sports Hub’s Toucher & Rich, the under-inflated footballs, that have become the focal point heading into the Super Bowl, passed a pregame inspection by officials. Apparently, the referees don’t always get out their gauges and check each of the 12 footballs that are submitted by each team. Sometimes they just check it by hand and if it feels good, they approve it and go to the next ball. One thing that has been reported this last week, as we’ve been learning about how footballs are treated before a game is that before every game, a referee measured with a pressure gauge each football to see if the pressure in each one is between 12.5 and 13.5 PSI. But that apparently isn’t always the case. As a matter of fact, from what I’ve been told, many times the refs don’t test the pressure of each ball with a gauge at all. Sometimes refs hold the ball, squeeze it, briefly inspect it, then sign off on it. Next ball. It’s never been a problem before. This is apparently a well known fact in the NFL. Now according to my sources, The Patriots turned in their footballs to the ref at a pressure just below the allowable PSI. If it’s a situation where the refs DID use a gauge, the refs would see the balls were under inflated, and inflate them to the proper size. 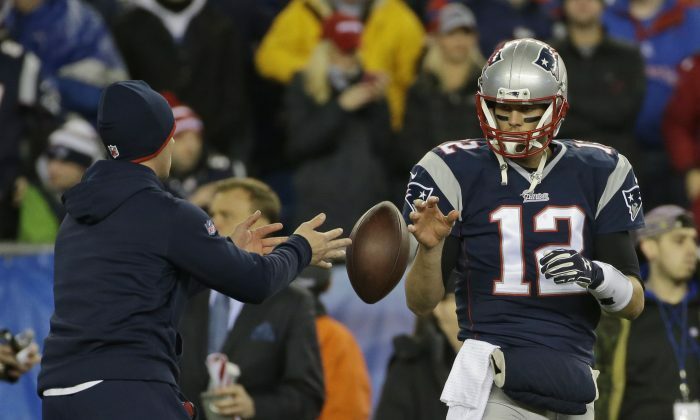 But in this case, the balls were approved and given back to the Patriots under-inflated. Thus, the under-inflated balls. The Patriots, according to my sources, played with league approved deflated balls. Meanwhile, the NFL is focusing on a locker room attendant who took the balls into the bathroom before heading out to the field. Bill Belichick was shocked to learn about the inflation scandal.